Many employees are forced to pay union dues as a condition of their employment. Are they aware of what or whom these dues support? Research from Center for Union Facts determined over $1 billion in dues over a six-year period went to support left-wing politics and Democratic candidates, as my colleague Kim Crockett wrote about here. For several recipients of this union money it is easy to identify them as liberal groups—such as the Democratic Governors Association and Planned Parenthood—but other names are less revealing and even sound like organizations that could support worthy causes: Minnesotans for a Fair Economy, Alliance for Quality Education, Citizens for Responsibility and Ethics in Washington. In a series of posts, this being the first, the Center will raise awareness about the different liberal advocacy groups being financed by union money without prior member approval, as reported by Union Facts. Next to the Democratic Governors Association—who received $14 million from America’s largest labor unions—Union Facts revealed America Votes as the second major recipient of union money at nearly $13 million. America Votes is “the coordination hub of the progressive community” working to “advance progressive policies” and “win elections,” according to its website. Because of this threshold, America Votes cannot donate directly to candidates or candidate committees, but it can pass along the money it receives from the organization’s PAC—America Votes Action Fund—and/or individual members. 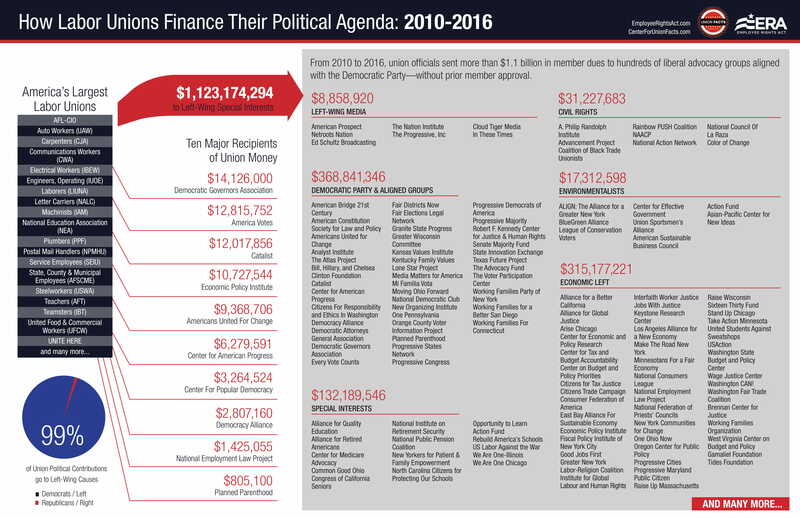 America Votes has used funds from individual contributions to support only Democratic candidates, according to available data released by the Federal Election Commission and reported by Center for Responsive Politics. Besides labor unions, other “partners” of America Votes include Planned Parenthood, NARAL Pro-Choice America, the House Majority PAC (“help[s] Democrats win seats in the House), and the Senate Majority PAC (“solely dedicated to building a Democratic majority in the U.S. Senate”). Stay tuned for the next segment of union politicking.